School of Mechanical Engineering, Tongji University, Shanghai 200092, China. The stiffness of a parallel manipulator is not only concerned with its detailed structure but also affected by the allocation scheme of actuators. Even though the precise values of stiffness cannot be derived since the link structure is not definitive at the stage of mechanism design, the effect of the allocation of actuators on the mechanism stiffness can be qualitatively evaluated in order to guild the optimal allocation. In this paper, the mechanism stiffness of a parallel manipulator is classified into the actuated stiffness and the structural stiffness. The actuated stiffness is obtained through the principle of virtual displacement and Jacobian matrix, and it is presented as a stiffness matrix which contains all the stiffness components and maps the stiffness of each actuator into the stiffness of the moving platform. The proposed analysis method of the actuated stiffness is suitable for all types of actuators. The structural stiffness is analyzed based on the principle of virtual force. A parallel mechanism is converted into a stationary structure when all active joints are frozen. The stationary structure is regarded as the combination of the basic links which are categorized according to their geometric shapes, join types, and load conditions. The proposed analysis method of structural stiffness takes account of all kinds of internal forces such as axial force, shearing force, bending moment, and torque. It can be seen that the allocation scheme of actuators plays an important role in the contribution to the stiffness of a parallel mechanism. 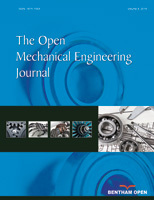 The stiffness analysis that is usually investigated at the stage of structure design in the traditional process of mechanical design is considered in anticipation at the stage of mechanism design in the proposed approach. The stiffness of the moving platform affected by the allocation of actuators is analyzed through the simplified mechanism model without the detailed geometric shapes or physical parameters of link parts, which is able to guild the optimal selection of an allocation scheme of actuators at the early stage of the design process.